Oma and Marshall enjoying snuggles on his first days. I clearly remember the first time our eyes met. Pure joy and love for our new born daughter. I vowed with my whole being to always love and protect this precious gift as long as I lived. I would always be there to make things right. Now here we were. My daughter was now a mother facing one of the greatest pains in life. It was completely out of my control. It was now in the hands of the Divine. All avenues had been exhausted and the time had come. My daughter and my son in law were in the room next door holding their precious son for the last time. They lay in bed reading, singing, and cuddling their two week old son trying to fit in as many life experiences as they could in their last moments together. After saying good bye and kissing my grandson for the last time, I sat in the room next door helpless and devastated. My heart ached as I listened to my daughter wailing behind the wall as sweet Marshall left this earth. They held him as his life force slowly left his body and his soul returned home. It felt so wrong and unfair. I could not get my head around what had just happened. It is still so surreal. Out of the darkness came beautiful light in the form of phone calls, letters, prayers, and compassion. They came from family, friends, and complete strangers around the globe. It was an unbelievable outpouring of love. This little angel had an immense impact in a short time, bringing such great love and light into the world. His memory and life still shine through all those who knew him and the inspiration this journey has sparked in others. I may not have been able to take our daughter’s pain away but I stand by her as she heals and walks this path with so many other beautiful families. Marshall remains close in our thoughts and we love him forever. This was written by my beautiful, loving and kind mother for the Tiny Footprints Gala this year. It brought tears to my eyes from the opening line and I am so proud of her for sharing her intimate perspective on this journey. I am forever grateful to have her love and support shine in my life. The loss of a child has far reaching impacts and shapes the lives of ourselves and those around us. Sharing different perspectives acknowledges the truth and deep roots of loss. Empathy for ourselves and for those who ache, grieve, grow and remember with us. 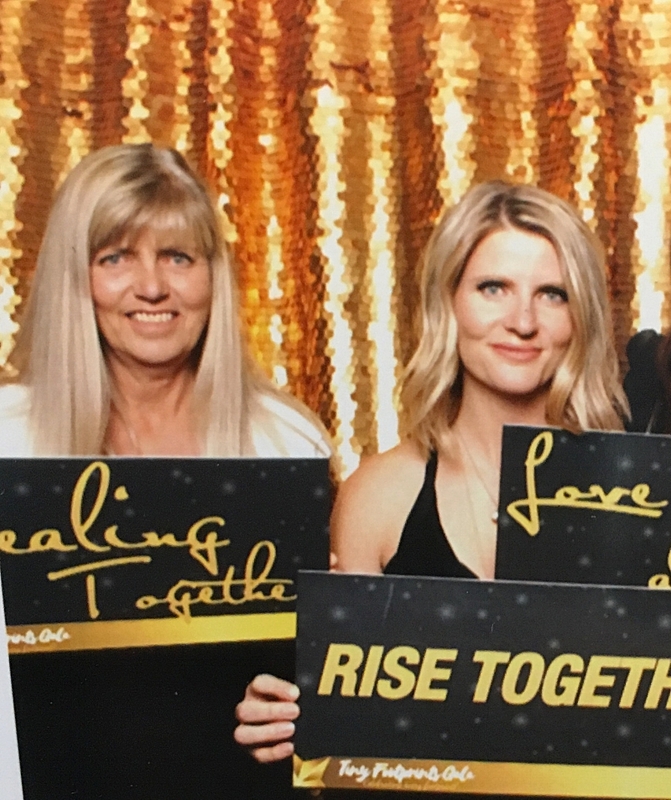 Oma’s story displayed at the Tiny Footprints Gala 2018 in Calgary, Canada. My mother and I celebrating Marshall and other little angels at the Tiny Footprints Gala 2018.